We specialize in medical detox and addiction withdrawal management in an environment that inspires lasting change. We will provide you with individually tailored medical detox program so you can get through this phase as smoothly as possible. Could not stop using on your own? You might have tried and failed. Withdrawal symptoms are hard and sometimes dangerous. Why suffer? Get help from our professional medical team to pass symptoms as safely and comfortably as can be. On a methadone or suboxone program and want to get off? 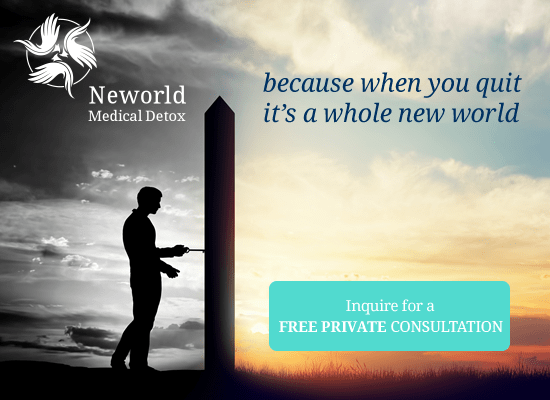 At Neworld, we have a special detox protocol for methadone and suboxone clients. Our physician will help you get off your daily dose. Walk out to a New World with no narcotics! Why commit to a long term residential program early on? Not ready to make such a commitment? There are lots of options for your treatment recovery post detox once withdrawal is behind you. NEWORLD will help you decide. Which counseling program is best for my case? 12-step? non 12-step?...Confused?. Take one step at a time. Detox first, then NEWORLD psycho-social experienced team helps you decide, and refers you to such a program. The wrong choice for a treatment program may lead to failure, wasted money and time on top of frustration and agony.